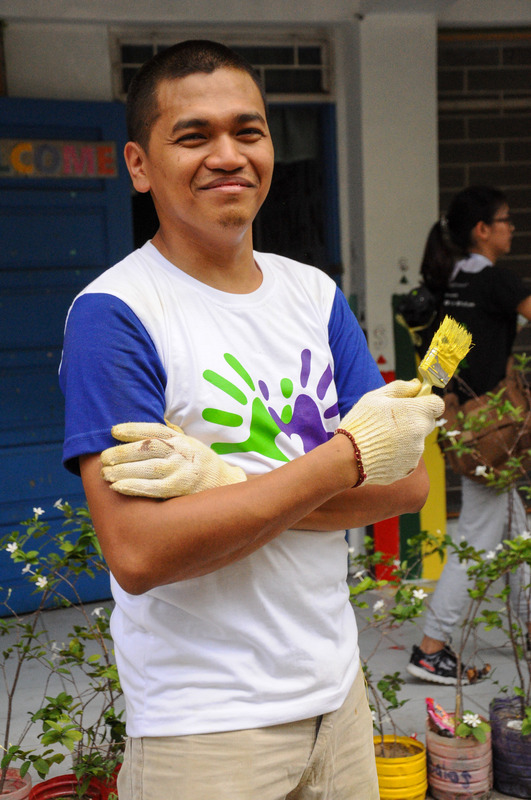 Team member Kris Advincula returns to his former school to help repair and rebuild it. When caring is at the very core of the environment that you are in, giving becomes as natural as breathing. Such is the case for the employees of TELUS International Philippines. Proud of its caring culture, the leading BPO company has inspired its team members to create a meaningful impact that goes beyond the confines of their workplace. Just last month, TELUS International Philippines volunteers were given the opportunity to give back to their community through the 12th annual TELUS Days of Giving. For this year’s event, students of Kamuning Elementary School and Quezon City High School, two of the biggest schools in Quezon City, were given a chance to learn in a more conducive environment. This was made possible by the joint forces of thousands of TELUS International Philippines team members, who painted walls and refurbished school furniture, all of whom were inspired to make a difference. Especially keen on creating an impact were Kris Advincula and Chloe Molina, both of whom are TELUS International Philippines team members and alumni of Kamuning Elementary School (KES). Chloe Molina graduated from KES in 1997. Twenty years later, Chloe, who was then known as Victor Molina, has been with TELUS International Philippines for more than 10 years and is currently a channel support representative. A staple at dance contests during her elementary days, Chloe shared that it was in KES where she met some of her closest friends. To this date, she still makes it a point to catch up with them regularly. “KES taught me how to be friendly. I was shy at first, but learning how to deal and create meaningful relationships at an early age has led me to who I am today,” Chloe shared. Just like little Victor, Chloe is still the cheerful and friendly individual. She claims that because of working at TELUS International Philippines, she was able to grow further. While at KES, she found her true self, it was at TELUS International Philippines where she has found a place where she belongs. “I like working at TELUS because I am fully accepted. It has created a safe space for the members of the LGBT community, and there is no hint of discrimination. I am proud of who I am today, and because of our company’s caring culture, I am able to give 100% to whatever I do,” she added. Kris Advincula left KES nearly 30 years ago. This did not stop him from reliving his fondest memories from his old school. First enrolled in KES back in 1989, Kris was the fifth child from his family to enter the elementary school. Unlike his siblings, who graduated from KES, he only stayed until third grade. However, his relatively short stay at the school created a lasting impact, which up to this point, he still holds dear. “I was a crybaby. I did not want my mother to leave our classroom, and I kept on whining. Luckily, I got assigned the nicest and most patient teacher I have ever had, Mrs. Olivia Oligario. It was Mrs. Oligario who taught me that respect goes a long way, something that I take to heart more than 25 years after,” recalled Kris. Now a team captain at TELUS Discovery, Kris makes it a point to share what he learned as an elementary student with his team members. To him, skills can always be learned and improved over time. It’s respect that creates a worthwhile working environment. “Normally, I only stay in a role or company for a maximum of three years. When a friend suggested I work at TELUS International Philippines, I did not want to pursue it at first. I was not articulate in English, and I had this notion that working in a call center would be stressful,” Kris shared. “I was proven wrong. Through TELUS International Philippines, I was able to experience an environment filled with respect and a culture that cultivates and opens up opportunities to every single employee. Ten years later, I am still with the company, and I am driven to create the same caring environment for my current and future team members,” he added. Both Chloe and Kris have not visited KES since they left. This year’s TDOG created an avenue for them to show their appreciation.